Cloud Printing Is Here--Do You Need It? A new wave of Web-connected printers from the likes of HP and Lexmark are changing the way we dole out documents. 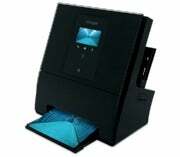 Instead of dumb single-purpose devices, a modern multifunction cloud printer like the HP Photosmart eStation can print any document from nearly any device, anywhere you have an Internet connection. It’s a quantum leap forward in terms of flexibility, and every small business owner knows you need to stay flexible and adapt to the needs of your customers if you hope to succeed. Web-connected printers may seem like a luxury, but here are a few reasons to consider upgrading your office printers to the cloud. Running a simpler, smoother, and more efficient business is the prime reason to launch your printers into the cloud. Whether your work demands traveling across the country or just across the street to Starbucks, printer drivers and network cables are the last thing you want tying you down. Web-connected printers allow you to print nearly any document from any device with an Internet connection. The advent of printer app stores like the Lexmark SmartSolutions suite means that you can automate routine tasks, like scanning timesheets and faxing legal documents, to the press of a button. If convenience is the most seductive feature of cloud printing, confidentiality is the most unnerving; keeping sensitive data secure on a physical server is troublesome enough without worrying about bouncing it back and forth between the cloud. Surprisingly, printing confidential data via a cloud printing service can be as secure as printing across your company network. While the basic HP ePrint service works with every HP ePrint printer and allows anyone to mail print jobs directly to the device, subscription services like ePrint Enterprise offer an added layer of security for confidentiality-conscious users. When you subscribe to ePrint Enterprise, employees printing from a Blackberry benefit from accessing a permanent, secure tunnel into your business VPN, where the ePrint Enterprise server operates behind your company firewall. Have you ever been confused about which printer is which on your office network? Here in the office we have four separate printers for different tasks, and I mistakenly send a complex label job to a paper printer or a color job to a monochrome inkjet at least two or three times a week. Establishing a cloud print server within your office network allows you to control the who, what, when, and where of document printing within your business, ensuring that employees will never waste valuable time and ink on botched print jobs. One of the most interesting and Orwellian features of HP’s new ePrint Enterprise service is a rule-based access control system (RBAC) that dynamically changes whether a “Print” button appears in an employee’s Blackberry mail client based on contextual clues like current location, the format of the file in question, and your enterprise print policies. Let’s be honest, trying to keep every computer in your office updated with the latest device drivers is an exercise in frustration. Mixing Mac OS, Windows and Linux machines (not to mention smartphones and tablets) on the same network with multiple printer configurations is a recipe for disaster. Sending print jobs to the cloud bypasses the compatability issue entirely; the rendering and rasterization functions typically handled by the print drivers on your desktop are taken care of by the print server instead, allowing you to print anything from any device, anywhere without having to worry about print drivers. To be frank, cloud computing is the future for small business. HP’s ePrint Enterprise service falls right in line with SalesForce.com and Google Apps as business software with service-based contracts that you can easily set up and scale to accommodate rapid changes in your business needs. In a perfect world we could abandon the printed page entirely in favor of digital distribution of documents, but many businesses still rely on mass-printing paper products like legal briefs, medical forms and sales contracts. If you deal in documents, investing in Web-connected printers allows your business to be more flexible and efficient than competitors who don’t have their heads in the clouds. The 'wow' factor of the Genesis's vertical profile and camera-based scanner compensates somewhat for the pricey inks. Fast, capable, and overshadowed by its detachable tablet control panel, this MFP offers a unique extra that may justify its price.